In true Whitewater fashion, the Warhawks continued their record setting season all the way until the very end. After getting out to a rough start in qualifying, they rallied the fourth set shooting over 900 to get even on the day. They continued the rally and climbed the ladder finishing qualifying in 2nd place, behind Webber International. ​During the lunch break, the Warhawks came up with another game plan and came out of the gate full speed ahead. In the opening round of the bracket, the Warhawks blanked Calumet College 4-0! The next match wasn't as easy as the guys faced a team they are very familiar with, Robert Morris. While the team had the opportunity to blank the Eagles as well, a misstep allowed Robert Morris to take game 4 and forced a game 5. Going into the 10th frame, it looked as if the Warhawks were going to end the day undefeated, they were going to have to bowl at least one more game to get there. 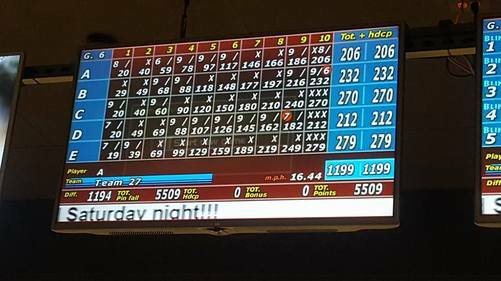 However, an unfortunately turn of events in the 10th frame (missed spare by Robert Morris) allowed the Warhawks to end the day 2-0 and head into Friday just one win away from the Final Four. ​Friday afternoon didn't start as the team had hoped as they just simply couldn't get anything going. The team ended up losing to the defending national champions, McKendree University 4-1. The guys rallied back quickly, unlike they've ever done before. They made quick work of Lindenwood University Belleville 4-1 allowing the Warhawks to make the Final Four for the first time in program history. But to make it to the championship match, the team would have to defeat McKendree twice. But the Bearcats proved why they were the defending national champions as they proved to be just too much for the Warhawks as we were defeated 4-2. 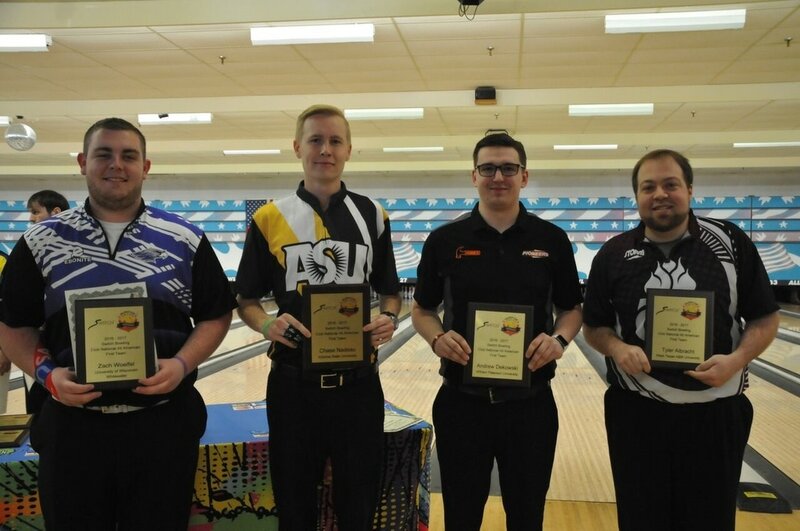 ​After watching the men's final, USBC Collegiate announced the All Tournament Team. And for the first time only, the Warhawks landed a player in this elite group! And to top it all off, not only did we place one player on the All Tournament Team, we were able to take two of the five spots! Both senior Zach Woelfel and junior Chris Wiley were named to the ITC All Tournament Team. Joining them were MVP Wesley Lowe from Wichita State, Nick Pate from Midland and Scott Hill of Lindenwood University Belleville. The Night Champions banquet kicked off the 2017 Intercollegiate Team Championships. And as in past years, this evening did not disappoint. Senior Captain Zach Woelfel took home two awards. He was named a First Team All American by the National Collegiate Bowling Coaches Association as well as the Collegiate Player of the Year Runner Up by the International Bowling Media Association. We arrived in Baton Rouge assuming these awards would be bestowed upon Zach based on his season stats. But Zach wasn't the only Warhawk to bring home individual hardware. 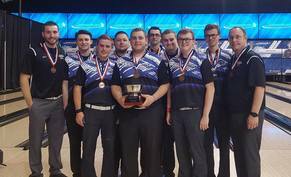 Head Coach, Shawn Wochner, earned his second Kerm Helmer Men's Coach of the Year Award from the National Collegiate Bowling Coaches Association. This award was given to Shawn based on the teams performance and the integrity of the program. The week is off to a great start, hopefully it continues once the team hits the lanes! After the Opening Ceremonies,the Warhawks got out of the gates hot. They went on to win all six of their qualifying pool play matches and were the only team to go plus for the 24 games of baker, winning the Marv Overby Pool. Marv is the former Florida State University coach. In match play, the Warhawks faced Saginaw Valley State University in the second round (after receiving a first round bye). After a hail mary in the 8th frame of game 5, the Warhawks went on to win 3.5.1.5. In the opening round Sunday morning, the Warhawks faced off with Purdue University. The Boilermakers proved to be too much despite being down their top player. The Warhawks lost 2-3. This sent the Warhawks to the Contenders Bracket. First up for the Warhawks then made quick work of Ohio State downing them 2-0 by shooting back to back 240 games. In the next round, the team faced the defending Collegiate Club Championships champions, Arizona State University. The first two games were won by the Warhawks, but both were gifts. ASU put in a sub to shoot a 9-pin in the 7th frame and it was missed, allowing the Warhawks to take game 1. And in the second game, an errant shot by the anchor player and failing to pick it up, allowed the Warhawks to advance. Their string of luck didn't hold up as they faced the Eagles from Morehead State University. Our two teams are all to familiar with each other as we have met in match play several times. And in true tradition, the Eagles were too much for the Warhawks at the Club Championships as they beat the Warhawks 2-1 ending the Warhawks run at the Carlson Cup. However, there was still more hardware to be earned by the team. By a vote of the coaches, Zach Woelfel was named to the Ebonite All Tournament Team! This is the third consecutive year a Warhawk has been named to the All Tournament Team! During the opening ceremonies of the 2017 Collegiate Club Championships presented by Logo Infusion, the Warhawks were well recognized. 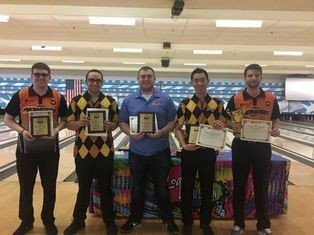 We had a total of five players recognized as finalists for the Club Teams Bowling Coaches Association All Americans: Billy Foertsch, Aaron Turner, Chris Wiley, Ryan Winters and Zach Woelfel. Head Coach Shawn Wochner was also a finalist for the Randy Widger Men's Club Coach of the Year award. Senior Co-Captain Zach Woelfel was honored as a Club First Team All American for the second consecutive year. Later during the Opening Ceremonies, he was named the Club Player of the Year. This is the first time someone NOT named Tang took home the honor. Shawn was also named the Randy Widger Men's Club Coach of the Year for the 3rd consecutive year and all three years that the award has been awarded. This award is extra special to Shawn as it is named after his former college coach at Western Illinois University. 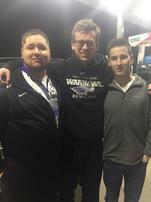 Warhawks Send 3 and Team to Baton Rouge! All of the individual success, all of the team success and all of the rankings mean NOTHING come the second weekend of March each season. Regardless of the team's ranking, the top 80 men's teams compete in the USBC Sectional Qualifier. But before the teams hit the lanes, the individuals (including those not on a team roster) have the opportunity to earn one of 24 spots in the Intercollegiate Singles Championships! For the second consecutive year, the Warhawks will be represented in the ISC's in Baton Rouge. However, this year the team will not have just one representative, we will have three! Juniors Drew Fakler and Aaron Turner will join Sectional Champion Josh Schneider (Sophomore) as representatives of our program. Drew finished 7th while Aaron took the final spot finishing 9th. Singles will take place Tuesday and Wednesday April 18th and 19th at the Raging Cajun Convention Center in Baton Rouge! Congratulations and good luck to each of these guys! Saturday, the focus turned to the team competition! And in true Whitewater fashion, the team got out to a strong start leading through the first 16 game block. However, after lunch, the team wasn't able to execute the shots necessary to maintain the lead. After the second game block, the team had fallen to fourth and only about 50 pins ahead of 5th place. Sunday, the team came back ready to fight and earn the program's fourth consecutive trip to the Intercollegiate Team Championships. Throughout the day, the gap between 2nd and 5th (and at times 7th) narrowed which put pressure on the guy to step up their game in order to clinch their spot. And that is exactly what they did. 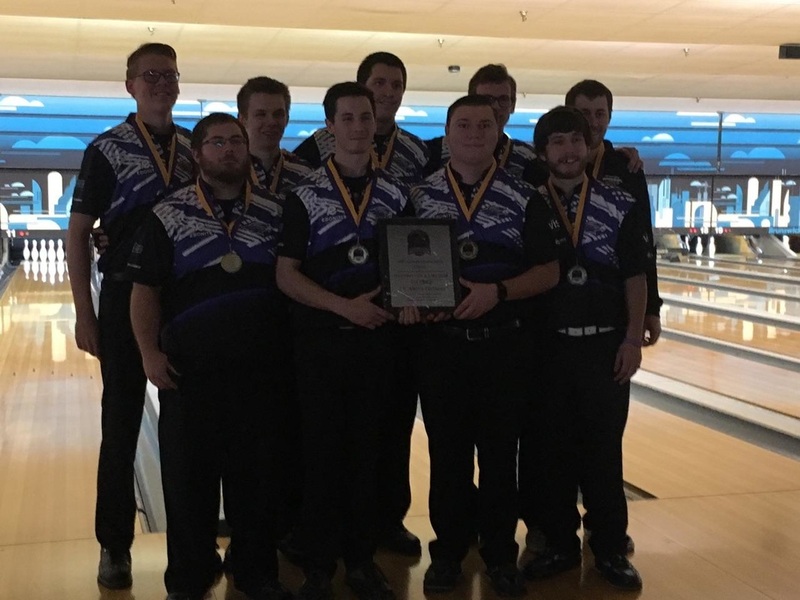 Once all 64 games were complete, the Warhawks found themselves in 3rd place which was good enough to punch their tickets to the Intercollegiate Team Championships! Now the team will head to Baton Rouge in search of the program's first national championship! The Intercollegiate Team Championships will kick off with practice and the Night of Champions Banquet on Wednesday April 19th with competition getting underway on Thursday April 20th. The finals will take place on Saturday April 22nd! Good luck to those on the team roster: David Eggert, Billy Foertsch, Josh Pate, Josh Schneider, Aaron Turner, Chris Wiley, Ryan Winters and Zach Woelfel as well as coaches Shawn Wochner and Nick Kruml! 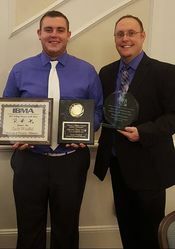 The Club Teams Bowling Coaches Association (CTBCA) announced their finalists for the Switch Club All American awards as well as their Randy Widger Men's Club Coach of the Year. The CTBCA also announced their four finalists for the Randy Widger Men's Club Coach of the Year award. Head Coach Shawn Wochner was once again selected as a finalist and is looking to earn the award for the third consecutive year. Good luck to all Warhawks who were selected as finalists! Warhawks Headed to Addison for Sectionals! 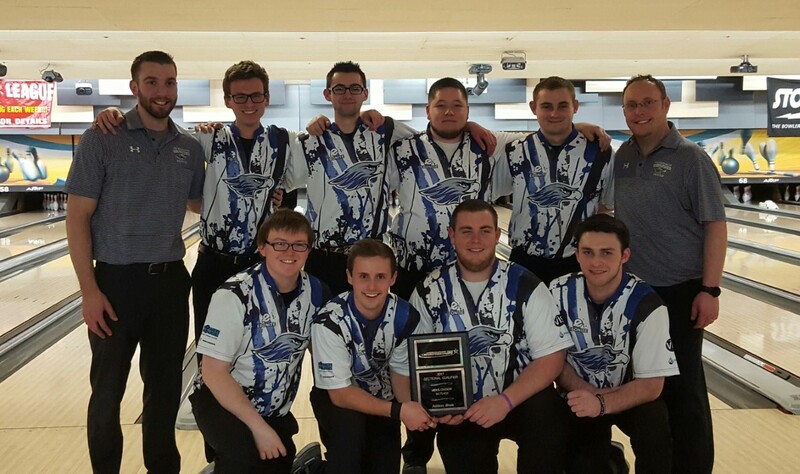 On Wednesday February 22nd, USBC Collegiate released their sectional assignments. While I thought we were going to end up in either Allentown, PA or Smyrna, TN, it ends up that we are in Addison, IL! This is great for so many reasons but certainly will not be a walk in the park. Action will get under way Friday March 10th at 7:50am with the Intercollegiate Singles Sectional Qualifier. Those who choose to participate will bowl 6 individual games. At least the top 4 (probably between 6 and 8) will qualify for the Intercollegiate Singles Championships in Baton Rouge, LA. The Warhawks will look to send a player for the second consecutive year as Nick Kruml was our first player to advance last season. Then 8:15am on Saturday March 11th and 7:30am Sunday March 12th, the team will compete in a total of 64 baker games. The Warhawks look to make their fourth consecutive trip to the Intercollegiate Team Championships! The UW Whitewater Warhawks finish 4th at the Hoosier Classic, final tournament of the regular season. The Warhawks battled a tough pattern on Saturday with 4 players ending the day plus for all 6 team games. At the end of the first day, the Warhawks were in a tie for 2nd place. However, Sunday's pattern was even tougher than Saturday and the team didn't execute as quality of shots. With the 4th place finish, the Warhawks qualified for the top 8 bracket. The team faced the #5 seed, Midland University in the first round. Seeing the third pattern of the weekend, the guys were accustomed to having to throw super quality shots and keeping precise lines. Well, the pattern for the bracket had as much room as most typical house shots. So while the guys were accustomed to making perfect shots, they had to get back to throwing good shots. Unfortunately, the softer pattern proved to be too much for the team as they couldn't free up their swings quick enough. On the bright side, we ended up losing to the eventual Hoosier Classic champions! 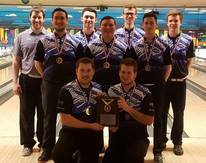 In the final Great Lakes Bowling Conference tournament of the season, the Warhawks came with a mission and were successful in completing that mission. The JV 2 team came out on top with the tournament win. Varsity was 2nd overall (1st among varsity) while JV 1 was 3rd overall. Sophomore Josh Pate won his second tournament of the year while Zach Woelfel finished 4th. Ryan Winters tied for 10th. 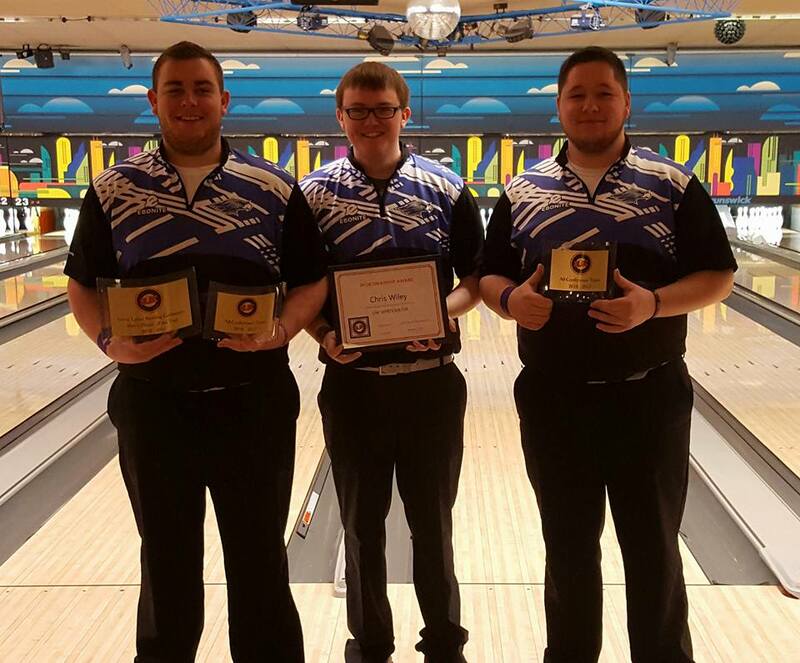 Two Warhawks were honored as part of the Great Lakes Bowling Conference All Conference Team. Senior Zach Woelfel and Junior Aaron Turner were both named to the team. Zach was also named the GLBC Conference Player of the Year. Junior Chris Wiley earned the Sportsmanship Award! This was the first year that the conference hosted a JV bracket championship. The bracket placed the top two point earning JV teams (must be from different schools) in a best of 5 bracket to determine the JV Conference Champions. This allowed the JV 2 team to face off with Highland JV. The Warhawks made short work of the Cougars winning in three games (218-175, 174-156, 212-157) to capture the first ever JV Conference Championship! On the Varsity side, the road wasn't quite as quick. In the opening round, the Warhwks faced off with #8 seed Winona State University. After losing the opening game 197-219, the Warhawks fought back to win a low scoring game 2 170-142 before rolling over game 3 206-133. In the semi-finals, the Warhawks faced off with #5 Iowa State University. Like the first round, the Warhawks dug an early hole losing the first game 175-195. However, the team rallied back winning a close game 2 199-233. The final game wasn't as close as the Warhawks dominated the Cyclones winning 233-132 to advance to the finals. In the finals, the Warhawks took down North Dakota State University in three straight games (233-153, 191-160, 234-210) not allowing the Bison an opportunity to make it much of a match. This win for the Warhawks marks the second consecutive conference championship and the 4th title in 7 seasons! Now the Warhawks will shift their focus to a post season mentality as they head off to Indianapolis next weekend for the 76 varsity team Hoosier Classic! We are hoping the team can continue the success they've been having since Allentown! It was a magical weekend for the Warhawks program. 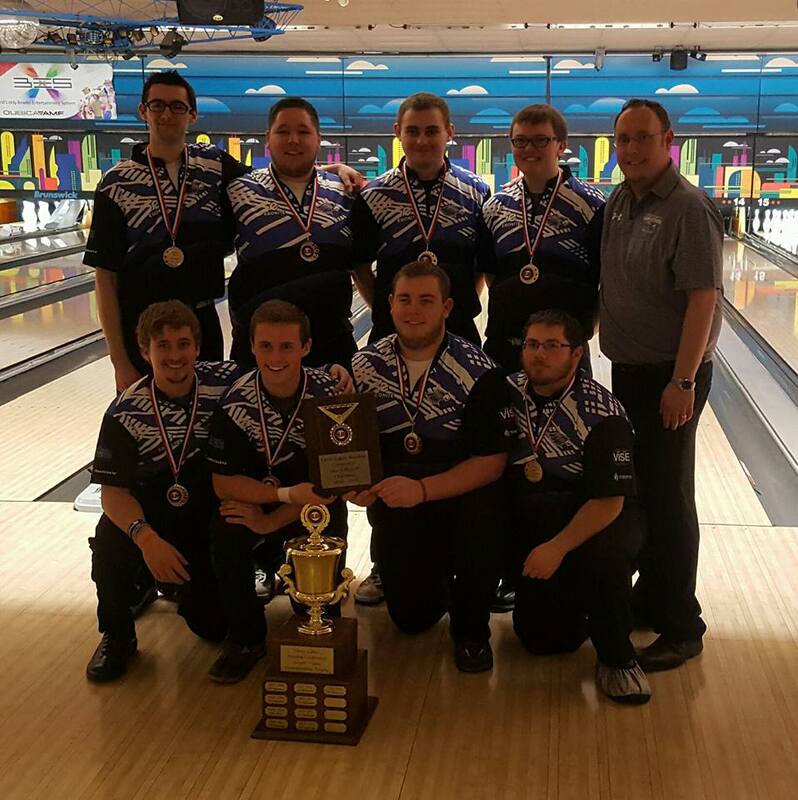 With the 3rd Great Lakes Bowling Conference tournament of the year, a milestone was reached! 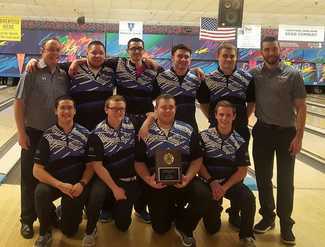 The Warhawks, under the direction of Head Coach Shawn Wochner won their 20th consecutive Great Lakes Bowling Conference (formerly the Wisconsin Collegiate Bowling Conference) tournament. This streak dates back to WCBC 4 during the 2011-12 season. 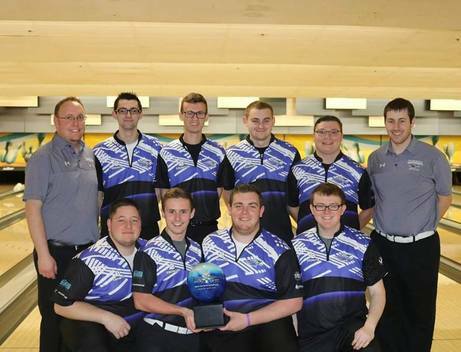 Not only did the program record their 5th victory of the season (also a record), they won the tournament in fine fashion, by 722 pins over UW Madison. Both JV teams also found success as JV 2 came in 2nd overall and JV 1 came in 3rd over all. On the individual side, Zach Woelfel won his second tournament of the season averaging 231.3333 for the six games. Billy Foertsch finished 3rd and Ryan Winters finished 5th (earning his first career All Tournament Team). Aaron Turner just missed the All Tournament Team finishing 6th while David Eggert was 8th individually. Also during this tournament, the team bowled a clean team game (50 fills). Ryan Winters had 20, Aaron Turner had 232, Billy Foertsch had 270, Chris Wiley had 212 and Zach Woelfel had 279 for a 1199 total! In our first tournament back in action after nearly a month off, the Warhawks wanted to come out and show that their Tier 1 win in Allentown wasn't a fluke or due to a "weaker" field. And that is exactly what they did at the 2017 ISBPA/Kegel Midwest Classic. The Warhawks came out with the lead after the first day and held on to it all day on Sunday. However, they were certainly given a scare by McKendree University. Heading into the last set of baker games, the Warhawks only had a 10 pin lead. After the 17th baker game, the Warhawks were trailing by 5. But they rallied back big the last three games to cruise to a 75 pin victory over McKendree. This win marks the second Tier 1 in program history! What an amazing weekend and accomplishment. Can't wait to see how the rest of the semester goes for the program! Well our annual Allentown, PA trip has come to an end. It was certainly a trip to remember. The guys had a great time running around Philadelphia on the 26th making stops at Independence Hall, the Liberty Bell, the Franklin Fountain and the Philadelphia Museum of Art (aka the Rocky steps). 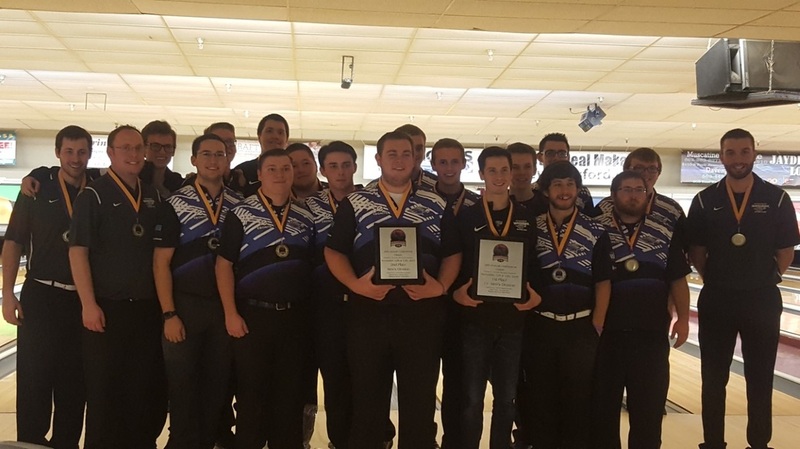 We then went on to compete in the Keystone Quaker Classic and while we didn't bowl amazingly superb, we did bowl well enough to pace the field and score our first Tier 1 win in school history. And the win came in dramatic fashion as we were down nearly 100 with 12 baker games to go. But the guys dug deep, rallied back and was able to win the tournament by 39 pins over a very talented Robert Morris team! Chris Wiley and Zach Woelfel both earned spots on the All Tournament Team! The second tournament was the Lehigh Valley Classic. While we started well the first day of the event ending the day in 2nd place and only 30 pins behind a spirited Morehead State team. The second day we lacked in executing shots and filling frames. The team fought back the last two games and ended up finishing up 6th overall. David Eggert also earned his first All Tournament Team finish! This trip was an amazing one and a great way to close out 2016 and our fall semester. Now for the team to put in the work necessary to prepare for the spring swing and our post season run. I'm hopeful that this past week shows the guys that they can compete with the best but also motivates them as they aren't the best yet! What a weekend for the Warhawks! After a bit of a struggle throughout qualifying finishing 4th, the varsity team pulled it together and stepped up in match play. In the opening round, the #4 Warhawks faced #5 Mount Mercy. We were able to defeat them in a tough match 2-1! We then went on to face #1 seed Midland, pitting the Pate brothers against each other. In this match we were able to sail into the finals winning 2-0! Then in the championship match we faced a very familiar #3 seed Robert Morris. We lost to them a month ago in the semi-finals of the Titan Invite before returning the favor the following week at the Leatherneck Classic. However, this meeting was for the championship. While we were gifted the first game, we took control of game 2 early to take the 2-0 sweep and claim our first Warhawk Open bracket championship! Not only was it an awesome weekend on the lanes, our parents put on an amazing fundraising effort! While I don't know any numbers yet, all I was told was that we raised more than last year. So thanks goes out to Becky, Wendy, Cindy and Cris for all of their organizational work pulling this weekend off and to all our parents who dontated raffle items, baked goods to sell as well as worked shifts at the tables. I'd also like to thank the alumni and alumni families that came back to help out as well! It was a huge success. Thank you! Now the team will focus on finishing the semester and final exams. Eight Warhawks will be heading out to Allentown, PA on December 26th for a pair of Tier 1's. Looking forward to seeinig what the team can do after a great fall semester campaign! Warhawks alumni and Assistant Coach Nick Kruml made his PBA World Series debut this past week. And while he was admitedly disappointed in himself, he did leave Reno with two cashes. Nick got off to a slow start in the first two events, but then found his groove during the Scorpion. Despite leading early in the block, Nick tapered off towards the end qualifying 22nd for the round of 24. The very next day, Nick had similar early sucess as well as a late day falter. This time, Nick's back half of the day dropped him out of the top 24...by just 2 pins. However, he had knocked down enough pins during the four animal pattern qualifying rounds to qualify in the top 42 for the World Championships. During his World Championships cashers round, Nick had a difficult time finding consistent ball reaction and reaction that was conducive to scoring. Nick finished the in 39th place and an average of 215.11 for 38 games. Then in his opening round of the Scorpion bracket, he faced off against #11 qualifier and fellow EBI staff member Tommy Jones. While Nick had an opportunity to win game 1, not being able to strike in the 10th cause him to go down 0-1 in the best of 5 match. Nick came back and won the next game handily. Then Tommy seemed to fall into a look and shoot 268 game 3 propelling him into a 3-1 victory. Tommy would then go on to win his next two matches placing him on the TV show. On the show, he was the high qualifier in the four man roll off with BJ Moore, Jesper Sevensen and Brandon Novak. Tommy went on to defeat BJ Moore for the Scorpion championship. The Warhawks are extremely proud of Nick! We wish him the best of luck with future PBA events he competes in! Both UW Whitewater teams found success at this years Leatherneck Classic. This tournament is typically the largest, strongest and toughest non-major in the country. There were 36 varsity men's teams and 16 JV men's teams. For the Varsity squad, the weekend was a bit of a roller coaster. The team started hot on Saturday and found themselves in the lead through the first three games. There were some mental missteps games 4 and 5 but the team rallied back the final game to end the stay strong. After day 1 the team was in 6th place. Sunday was a lot like Saturday. They got out of the gates ok but then fired two big baker sets to put themselves within 60 pins of the lead with one baker set to go. Seeing the light at the end of the tunnel, the train derailed dropping the Warhwawks to 5th place. Which to be honest, at this tournament, with the quality and size of the field, is really good for this young team. ​On the JV side of town (yes they were in two different centers), they got off to a slower start on Saturday but were able to rally back and finish the day big. The ended the first day as one of only 5 teams on the plus side. During the 16 baker games, they paced the field and coasted on to be the high qualifier among JV teams. During the bracket, the Varsity team started their first match with Robert Morris. This was a rematch of the semi finals from the Titan Invite just one week before. With the match tied 1-1, the Warhawks were gifted the final game due to two late opens from Robert Morris. In the semi finals, the Warhawks faced Wichita State University. Timely brooklyns by the Wichita State anchor and an unlucky break from the Warhawks anchor, game one went to Wichita State. 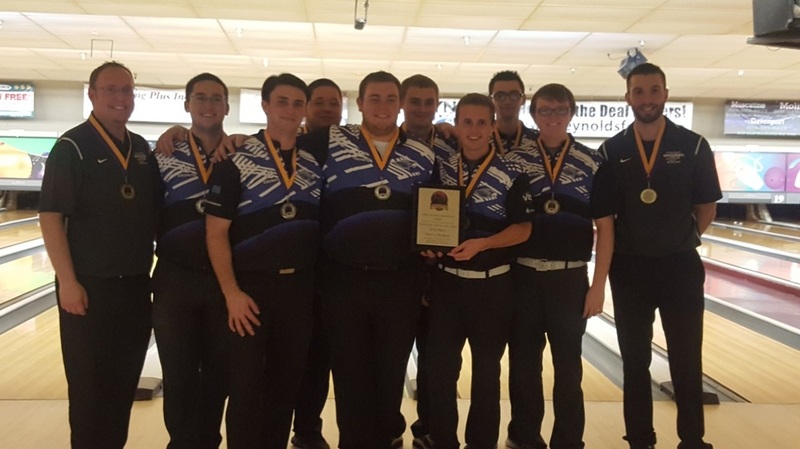 With their backs against the wall, the varsity guys rallied and swept the next to game advancing them to their third consecutive championship match at the Leatherneck Classic. The team now had the opportunity to defend their championship from last year. However, the breaks were put on those plans early as the team couldn't get anything going while Lindenwood University Belleville found their groove early and took advantage of the opportunity. While the team was hoping for the win, they were excited with 2nd as it proved to them that they have what it takes to compete at the highest level! On the JV side of the bracket, the team started their first match with Robert Morris who just squeaked into the bracket. The JV team was able to dispose of them quickly and then they set their eyes on the championship. In a rematch with Calumet, both teams brought everything they could. In fact, at the end of the 3 game match, the series was tied 1.5 - 1.5, thus forcing a decisive game 4. In that game, the Warhawks rallied and sailed away as the Leatherneck Classic JV Champions! Congrats guys! This past weekend at the Titan Invite, in Neenah WI,the Warhawks traveled all three teams in hopes of continuing their success. The field included only 14 varsity teams and 7 JV teams. Our Warhawks were able to finish 3rd, 4th and 5th respectively. The two teams that finished ahead of us were Calumet and Robert Morris. In the bracket, the Varsity team rolled quickly past UW Milwaukee. They then faced a very tough Robert Morris team! Despite a great effort, the team fell short of advancing to the finals. On the JV side of the bracket, JV 1 lost to Calumet while JV 2 defeated Robert Morris in the opening round. In the second round, JV 2 tried to avenge the JV 1 loss to Calumet. This was a great final match. Both teams put up some shots, but in the end, it was the Crimson Wave of Calumet that brought home the JV championship. The second Great Lakes Bowling Conference tournament took place at the Lanes on 20 in Racine, WI. The Warhawks once again walked away with a solid victory. The Varsity team was able to amass 905 pin victory over Highland Community College. Sophomore Josh Pate earned his first All Tournament Team finish, and he did it in style by winning the individual portion. Transfer junior Aaron Turner was 2nd. With each tournament that passes, the team gets better and better. The guys will continue to work hard the next couple of weeks before heading to Neenah, WI for the Titan Invitational November 5th and 6th. After a struggling first week of competition, the Warhawks came out with a different look, a different mindset and a different ability to execute. While the team finished 13th out of 41 varsity teams, the guys certainly showed great signs that the talent and ability to compete on the biggest stages are within! Through the first four games, the team was in the top 6 of the standings on Saturday. After a slow start, they were able to rally and shoot nothing under 1080 for the next three games. This showed that the team had the ability to hang with some of the biggest and strongest teams in the country. However, the next two games showed our youth and inexperience. Sunday saw it's ups and downs as well. Bakers are always a different beast to try to tame. But the guys were more focused than the previous week and were able to go plus despite a horrible set. Looking forward to a weekend off and two intense weeks of practice before heading into our third tournament October 15th and 16th in Racine, WI. With the start of a new season also brings a whole new look to the Warhawks Varsity Team. At the conclusion of the 2015-16 season, we lost six seniors. This was a huge loss both in terms of physical game and experience. However, we have two returning Varsity players, a slew of returning JV players who are looking to step up as well as many new players who are eager to play an immediate impact. The highlight of the weekend was, for the first time in conference history, the Warhawks Varsity team won while the JV 1 team came in 2nd overall and the JV 2 team came in 3rd place overall! This was a tremendous feat and unprecedented in the conference. While the team was able to pull off more than a 700 pin victory, our execution, communication and overall "teamness" was sub par. These deficiencies are being chalked up to spending two weeks practicing at Hawk Bowl instead of our facility on campus. But in the end, a win is a win and there is no better way to start the season. A special congratulations also go out to Zach Woelfel on winning the first tournament individually and first year Warhawk (third year collegiate player) Aaron Turner on finishing 3rd individually. 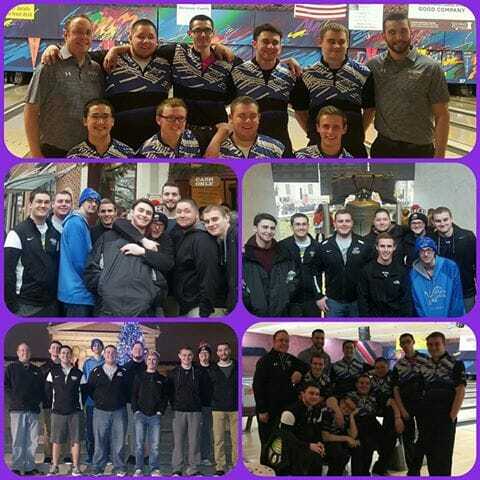 Keep up the great bowling guys! 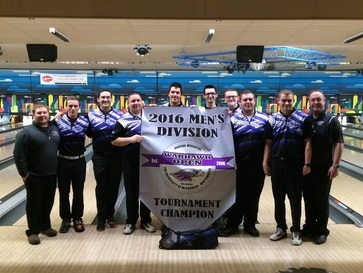 This is the tryout information for the 2016-17 UW Whitewater Men's Bowling Team! Below you will find everything that you need to know in order to try out for the team. Cost: $100 Must bring cash or check (made out to Whitewater Men's Bowling) to the meeting prior to tryouts starting on Tuesday September 6th. * - For each of the two 5 game blocks, competitors will be awarded points based on their rankings in each of the following stat categories: single pin conversion, multi pin conversion, strike percentage, fill percentage, pin count and average first ball count. ** - For the 8 game block, competitors will be awarded points each game based on the highest game that game. This will happen each of the 8 games and for the 8 game total as well. **** - For the written interview, players will be emailed a series of questions that are they expected to answer and return to Shawn Wochner prior to the start of the first block of qualifying. While these will not be directly evaluated, they will be used in the case that coaches are deciding between players for the final spots on the Exclusive 12 and Travel 12. Exclusive 12 - This group will have the opportunity to travel to collegiate tournaments during the 2016-17 season. They will also be required to ONLY throw bowling balls from the Ebonite International family (Columbia 300, Ebonite, Hammer and Track) during college competition. They will receive up to 3 free EBI bowling balls. Travel 12 - This group will have the opportunity to travel to collegiate tournaments during the 2016-17season. While they will not be required to be exclusive with EBI bowling balls, if they are selected for any post season play, they will be required to have a full arsenal of EBI equipment. Developmental Team - This group will have practice rights but will NOT be able to travel and compete in collegiate competition during the 2016-17 season. Competitors selected to the Developmental team will be required to pay team dues in the amount of $200. This money will be due by Tuesday September 20th.